On rare occasions, a gallery does such amazing things with its space that you kind of want to poop yourself with excitement. Gallery 1988, which has one branch in Los Angeles and one branch in San Francisco, makes me want to just that with their latest exhibits. They are doing such exciting things with their space that I kind of wish I was in California to be able to attend their openings more often. While tomorrow’s show will be about the current show at their SF location, this post will be about their current exhibit on display at the LA location, entitled Idiot Box. Prepare to be absolutely astounded by what these artists have managed to turn memories of your favorite childhood television stars into. Fresh Prince of Bel-Air, Jem, Alf, Gumby, Ren & Stimpy, Urkel, and many, many more individuals are paid homage to, artistically, offensively, and ridiculously. Honestly, though, this group show is so amazing that this blog post CANNOT even come close to doing the show justice, so please rush over to the gallery’s blog about this show or to their website. Seriously. 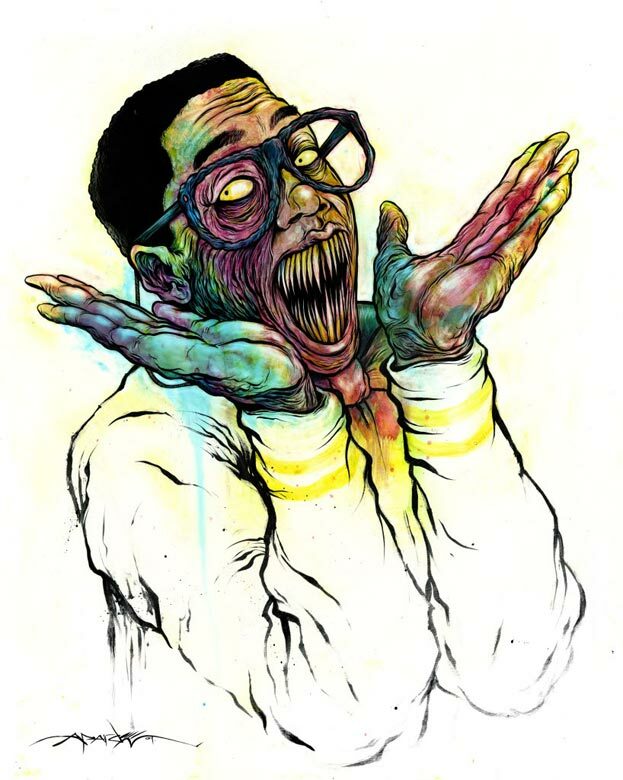 Fan favorite Alex Pardee flexes his horror-art muscles yet again by turning Urkel from “Family Matters” into an infected (playful) beast in S.Urkel Jerk. 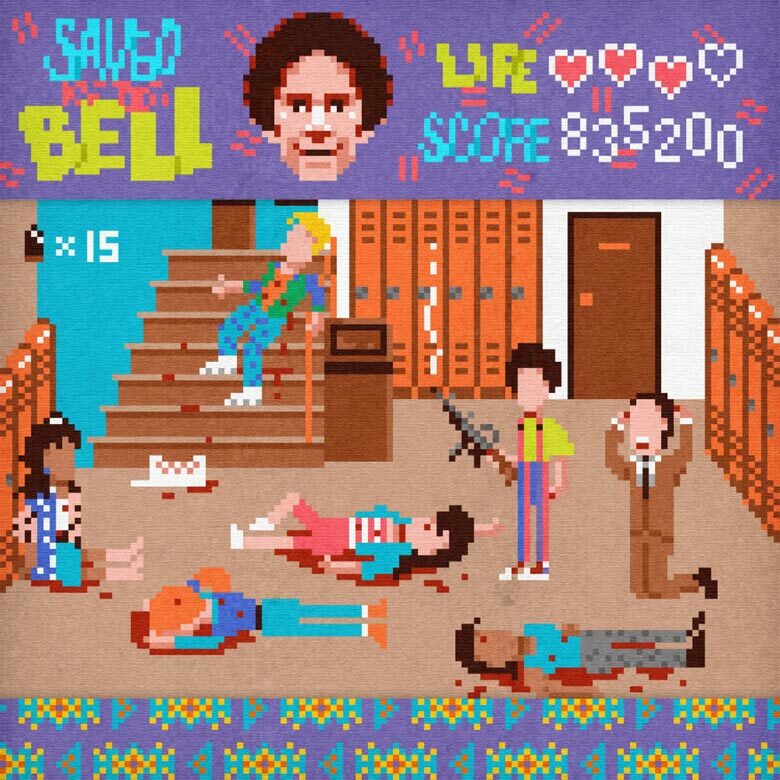 If all of the mishaps, misunderstandings, and formations of social circles from “Saved By The Bell” were present in this day and age, the playful high school television show might look a little something more like this bloody video game pixel mess. 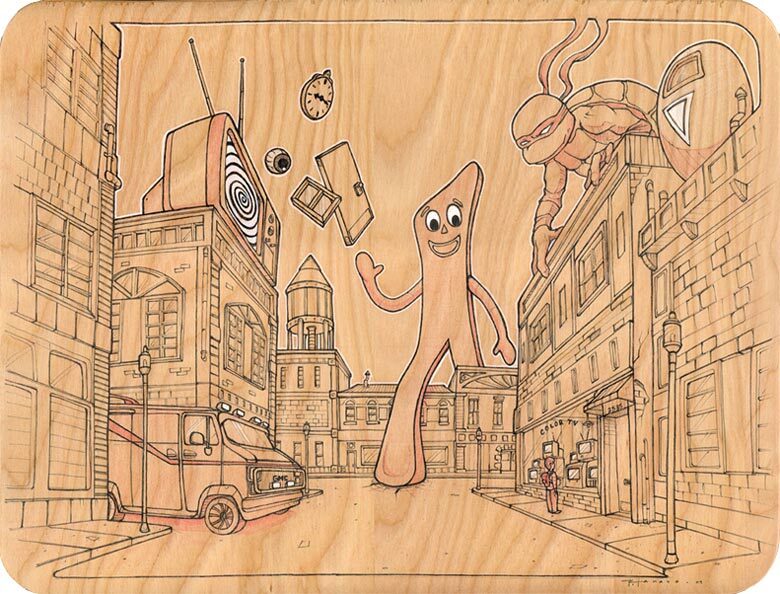 Raw as the idea for this piece is, Jude Buffum has managed to genius take on a classic television show. “Schoolhouse Rock” has been parodied in many a television show, but it’s hasn’t been quite so present in the art world. 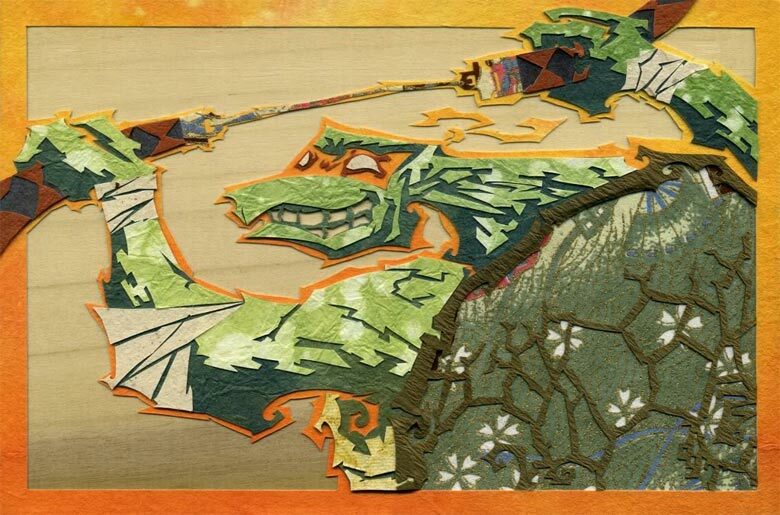 Interplanet Janet Leaves The Boys Behind by Patrick Gannon features colored, cut paper marvelously arranged on wood. 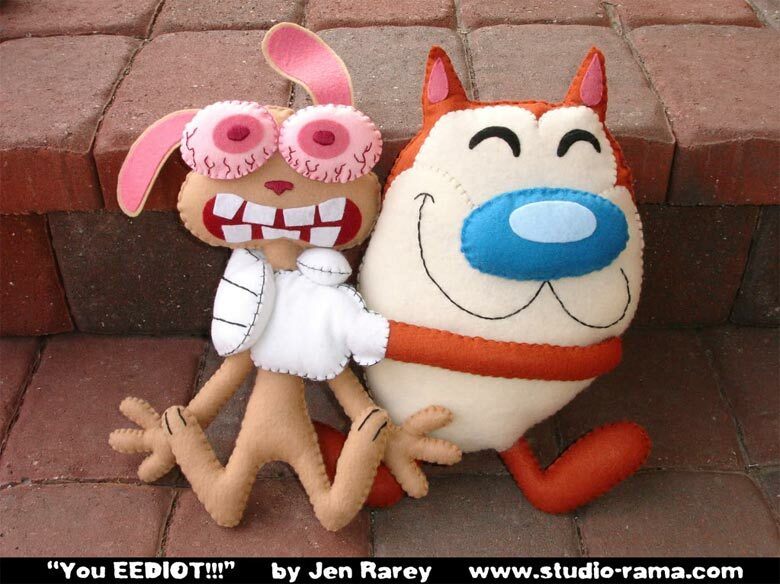 Part of me thinks that Nickelodeon wouldn’t be too pleased at these plushies of Ren and Stimpy, but these 12″ tall plushies by Jen Rarey are just precious. 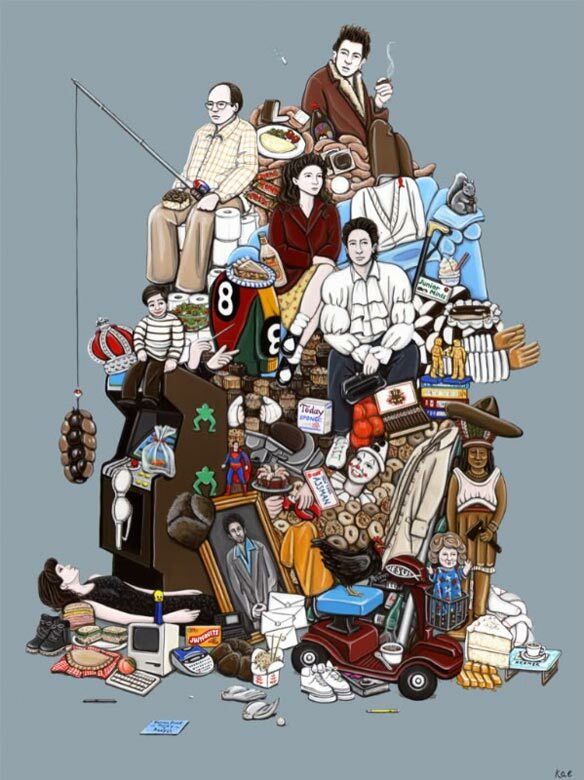 Believe it or not, there are 99 Seinfeld references in this piece by Kiersten Essenpreis. Ridiculous. The piece sold out quickly, as one might imagine, but prints will be available through Gallery 1988 soon. Keep your eyes peeled. Although the real MacGuyver would have been equipped with some items more useless than duct tape and a Swiss army knife (such as a clothes hanger and some chewing gum), Wade Schin‘s one-of-a-kind acrylic MacGuyver is a terrific creation. Kudos. 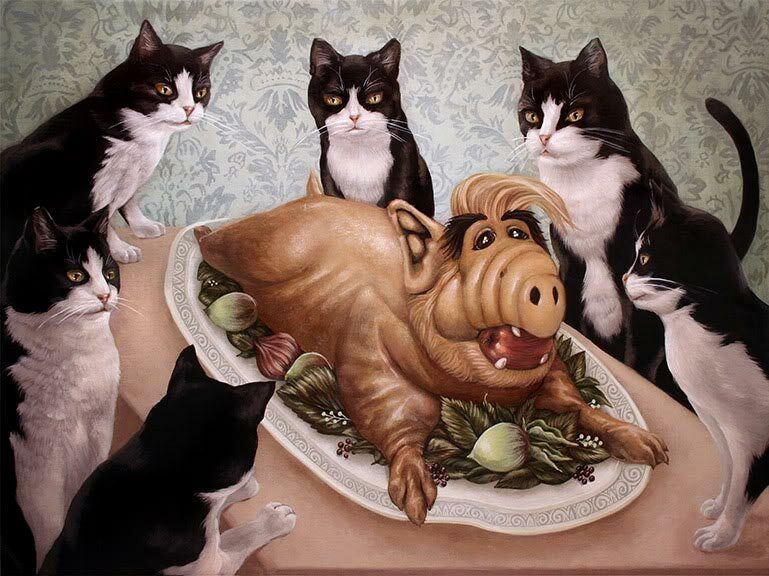 Lolcats meet Alf? Casey Weldon‘s We Can Has A.L.F.? is horrific and awesome at the same time. The sheer number of amazing pieces in Idiot Box is amazing and this post could honestly be three or four times longer, but I will close it out with Another Battle For My Affection by Roland Tamayo, which references Gumby, The Twilight Zone, Ninja Turtles, and many other lovable television shows.